Our range of products include hydraulic manifold block and hydraulic power pack units. 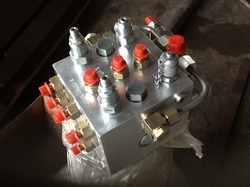 We are counted amongst as the leading manufacturers and suppliers of high quality Hydraulic Manifold Block. These manifold blocks are manufactured utilizing optimum quality material and latest technology keeping in mind the set norms of industry. Offered manifold blocks are quality checked on several quality parameters to ensure their defect free range. In addition, these manifold blocks are used for manufacturing these manifolds that are available in different pressures. Backed by the team of experienced professionals, we are able to manufacture and supply a precision engineered range of Hydraulic Power Pack Units. This power pack unit is precisely manufactured with superior quality material & leading techniques under the supervision of professionals. Our offered power pack unit is used in different industries for facilitating drainage of fluid and protection against system shock. We are giving this power pack unit to our customers at industry leading rates.